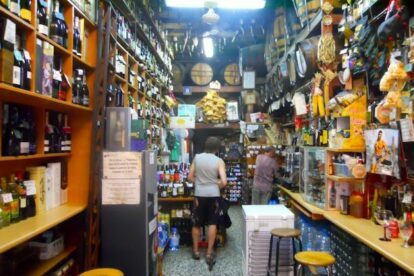 One of many pleasures in Barcelona is buying wine from local bodegas. You can sample the wines and have a snack while deciding which wines to buy. You can buy most Catalan varieties of wine from the barrel for between € 1 and € 2 a litre. And, you can buy a case of wine or cava at better prices than in supermarkets. This small, popular bodega is just a few metres from John Lennon Square and a hundred metres or so from the Abaceria Market. They stock an excellent selection of wines, cavas and spirits, and they serve tasty bites of fuet or llonganissa (sausage), berberechos (cockles), croquetas, and simple bocadillos (sandwiches). During the winter months they also serve hot caldo (thin soup). I often call in on the way to or from the market or library for a beer and a snack. They regularly have special deals on wine and cava and it’s worth checking out the prices when stocking up for a party. And it’s always fun to check out some of the more obscure licores, colourfully stacked from floor to ceiling. Go on…wander in… surprise yourself. You’ll be glad you did.